This volume of Burke's writings and speeches is divided into two parts. The first covers the period between the time of his retirement from the House of Commons in 1794 and his death in 1797. His main preoccupation during this period was, of course, the French Revolution and the progress of the war against France. Surveying developments with dismay and apprehension, he produced a critique of the Revolution which expressed much of his mature thinking on political and social life, and issued a clarion call for a European crusade to save civilization. 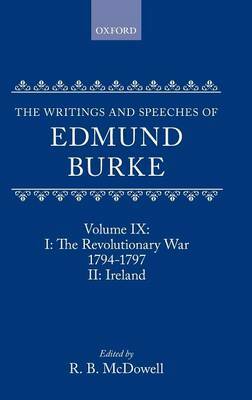 Part II contains Burke's writings and speeches relating to Ireland. From his entry into political life, he was intensely interested in Irish problems, religious, economic, and constitutional, and in Anglo-Irish relations. Fervently believing that Great Britain and Ireland should be partners within the Empire, in his last years he was deeply disturbed by the influence of the French Revolution on Irish politics.